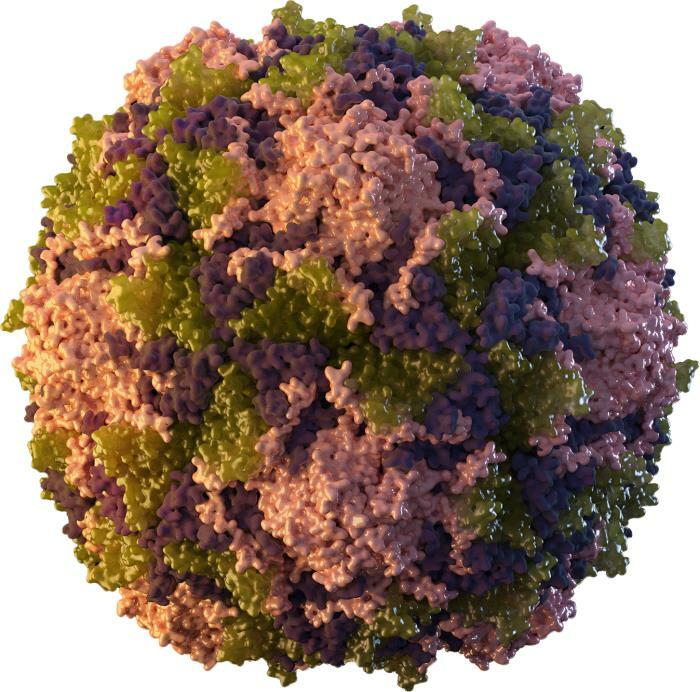 This illustration provides a 3-dimensional (3D) graphical representation of a tightly packed icosahedral poliovirus particle that consists of 60 copies each of capsid polypeptides designated as VP (viral protein) 1 (Pink); VP2 (Green); VP3(Purple) and VP4 (not shown). ; The particle is composed of units of four capsid polypeptides that interact in groups of five; resulting in a viral particle that has 5-fold (pentamer) and 12-fold symmetry. ; A deep “canyon” on the capsid surface surrounds the apex of each pentamer of the virus. ; The canyon together with the pentamer apex are used as the site for capsid binding to cellular receptors. Photo Credit: Meredith Boyter Newlove, M.S.